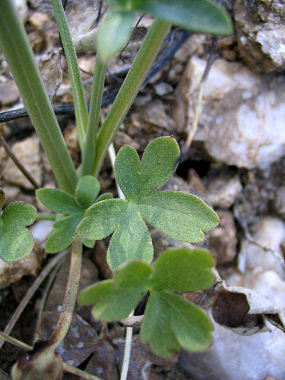 The Barestem Larkspur is a member of the Buttercup Family. The plant grows to 30 inches in height and can be found on gravelly mesas, hillsides and open desert at elevations below 5000 feet. Leaves are dark green to 2.5 inches in width. 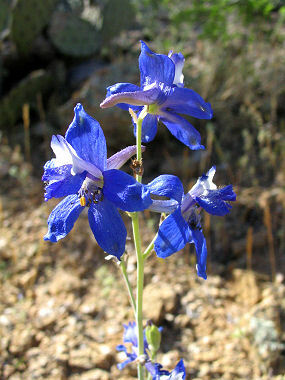 Also known as Delphinium, the Larkspur contains delphinine and other alkaloids. These toxins are poisonous to humans and livestock. The Barestem Larkspur typically blooms between March - May, and produces blue flowers with a white center and a backwards projecting spur.